How did they make a record where the outcome couldn’t be predicted? 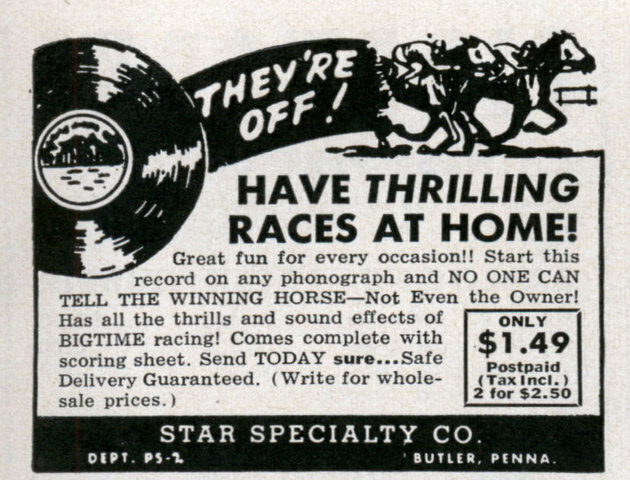 HAVE THRILLING RACES AT HOME! Maybe the same as Monty Python’s LP “Matching Tie and Handkerchief”. Instead of one groove there are multiple grooves, each of which extends from the edge to the center. Think of hypno-coins. Which groove plays depends on which happens to be taken when the needle is placed on the record. It turns out to be fairly random. It drove me nuts when trying to play the third side of the Monty Python album. I second the guess (or second-guess) that it’s multiple parallel grooves. There was a Henny Youngman LP in the 70s with the same gimmick. You’d randomly get one of a bunch of monologues, depending on where the needle fell. The horse racing disk would have been a 78. (33-1/3 LPs were just being invented in 1948, and the public didn’t have the means to play them yet.) I guess somebody had a multiple-track cutting lathe even then. Maybe I’ll just send in my $1.49 for the record and look for myself. I also found a ebsite with details on a 1932 record with title info as well as a chance to play the 6 tracks at random. I worked at a radio station back in the mid 80’s, and we had several multi grove records, which we used for “on the air” contests. One of these was indeed a horse racing record. “Now caller number 13, which horse do you think will win the derby today? If you guess right, you win 5 pounds of carrots and a turnip from Roger’s Garden Market.” was the general idea. Corny as all get out, but people loved it. I wonder if a CD or DVD could do this. It would be great for games or movies with multiple endings. I got a record just like this as a child in the 80’s. Probably still have it. 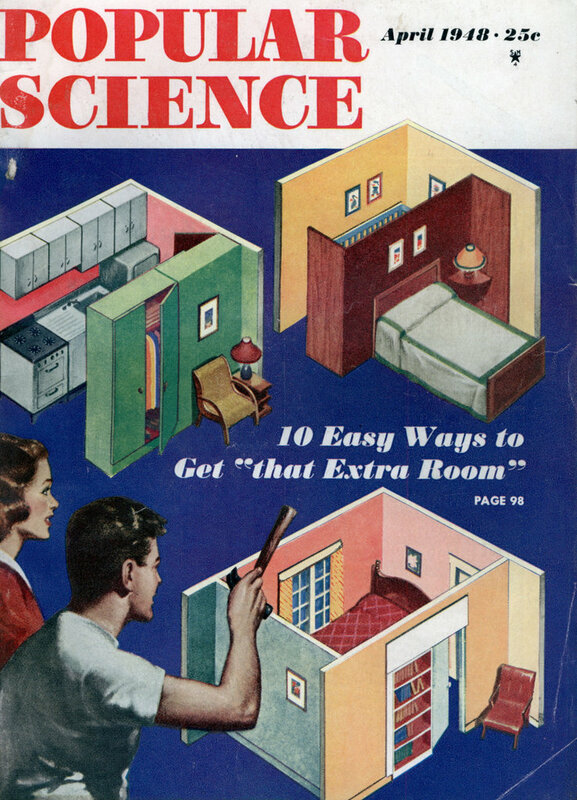 Neat to see that they were around for decades before my time. MAD magazine had one of these in an issue in the early seventies. I think it was called “A Wonderful Day”. DVDs and CDs are both spirals, not concentric circles.